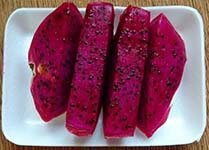 Sweet, juicy dragon fruit is obtained from the cactus family plants of Central American origin, in the genus: Hylocereus. They sold as pitihaya or pithaya (Spanish name) in the western markets. It is one of the popular South-East Asian countries, especially Thailand, Malaysia, and Singapore. Some of the common names are strawberry pear, thanh long (viatnamese), Huolóng guo (Chinese), Doragonfurutsu, and Kæwmangkr (in Thai). Red color fruit coat with white color flesh (Hylocereus undatus): Most common type. Red color fruit coat with red color flesh (Hylocereus polyrhizus). Yellow color fruit coat with white color flesh (Hylocereus megalanthus). Hylocereus species grow well under the tropical climates. In general, cuttings of the mother plants preferred for plantation over seedling. Being a delicate stem plants, cacti needs trellis to support upright growth. It begins fuiting from the second year of plantation. By the month of April, many attractive, cream-white colored flowers appear on the plant which bloom at night. Fruits will be ready for harvesting 30-35 days after successful pollination of flowering. Fruiting period which begins by June will continue up to November. Mature fruits picked up frequently for up to six times within this period. The outer coat in immature dragon fruits is bright green in color. As the fruit matures, it turns red in color with ripening. On the inside, ripe fruit features juicy, semi-translucent, pearly-white flesh is dotted with black seeds dispersing uniformly all over the flesh. The fruit features the texture of kiwifruit, and flavor that is reminiscence of melons. Dragon fruit is modest in calories, comparable to that of kiwifruit, carrying about 50 calories per 100 g. Nonetheless, it holds many health-benefting antioxidants, minerals, vitamins, and fiber. Crunchy black seeds of dragon fruit carry an antioxidant phytochemical compound phytoalbumin. Phytoalbumin thought to improve appetite, work as laxative, and good for skin and hair health. The fruit is an excellent source of antioxidant vitamin-C; providing about 8-9 mg per 100 g or about 12-15% of the DRI (daily-recommended intake). Consumption of foods rich in vitamin-C helps the body develop resistance to combat against infectious agents and scavenge harmful free radicals. Red flesh type pithaya carries contains very healthy levels of vitamin-A, and carotenes. Together; these compounds have been known to have antioxidant properties and are essential for vision. Vitamin-A also required for maintaining healthy mucosa and skin. Consumption of natural fruits rich in carotenes is known to protect from lung and oral cavity cancers. It also contains good amounts of minerals like phosphorus, manganese, iron, and magnesium. Manganese used by the human body as a co-factor for the powerful antioxidant enzyme, superoxide dismutase. Magnesium is an important bone-strengthening mineral like calcium. Fresh dragon fruits hit the markets in Thailand by June end, and lasts till November. However, these days fresh pitihaya can be available around the year; thanks to the revolution in farming, storage and transportation technologies. In the stores, buy fresh harvest; look for green-tips on the scales. Ripe fruits just yield to thumb pressure. Though, they can be available most of the year; they are at their best between June until December. Only mature fruits should be harvested and handled carefully from the cactus vine. At home, ripe fruits best enjoyed soon after purchase. For extended usage, keep them in the fridge for up to three days. Cut sections, wrapped in thin plastic cover, can stay well for a week if stored in the refrigerator set at appropriate humidity. Wash fruits in cold running water. Fresh, ripe fruits best eaten on their own without any seasonings/additions. Its peel is tough and inedible. Cut the fruit in half. Scoop the flesh using a spoon. It can also cut into slices/cubes. Fresh, juicy pithaya are so delicious that they can be eaten as they are without any seasoning/additions. Enjoy their rich, unique flavor and crunchy texture of tiny black seeds. Its flesh can be enjoyed in shakes, sorbets, smoothies and in fruit cocktails with coconut water, lime juice, honey, etc. Fresh pithaya chunks can be a great addition in fruit salads. It is also employed in the preparation of jams, marmalades, jellies, party-cakes, etc. Allergic reactions to dragon fruit are rare. Pregnant mothers and children can safely eat them. (Medical disclaimer). 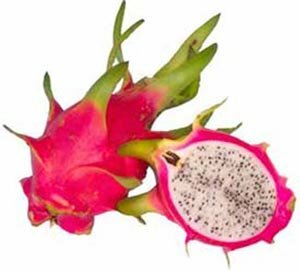 <<-Back to Fruits from Dragon fruit. Visit here for an impressive list of all variety of fruits with complete illustrations of their nutrition facts and health benefits. Fruits research & Development Institute (FRDI).